Paradise Valley is one of Montanas most stunning valleys, backed up against the Absaroka Mountains. A gorgeous destination that draws travelers from across the country, Paradise Valley is a major river valley of the Yellowstone River, stretching from Gardiner to the fly-fishing town of Livingston. From fishing in the Yellowstone River to venturing into the backcountry for a hike, Livingston has something for everyone during any season. You'll also find wonderful art galleries, museums, restaurants, and other great places filled with Western hospitality and culture. Follow the valley south to Gardinerthe north entrance and gateway town to Yellowstone National Park. Grab a burger and beer at the Two Bit Saloon or the Iron Horse Bar and Grill, perched above the Yellowstone River. For winter gear rentals, such as snowshoes or cross-country skis, visit Parks Fly Shop. In the summer months, spend a day exploring the park, then return to Gardiner for dinner and a cozy cabin along the river. As if there weren't enough reasons to visit already, the area has several hot springs, such as Chico Hot Springs and La Duke Hot Springs. Making Paradise Valley one of Montanas premier travel destinations. Check out our available Livingston and Paradise Valley vacation rentals to find a beautiful place to stay during your visit. 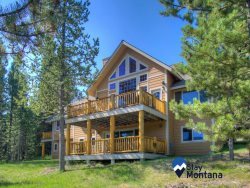 Crazy Mountain Lodge - Main Lodge Sleeps 12 Comfortably! Add Guest House for Additional Sleeping! Paradise Valley Retreat - Beautiful home with phenomenal views and hot tub!